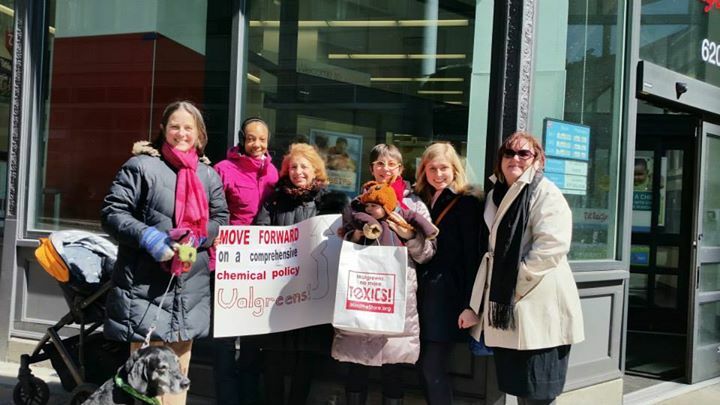 Cindy and partners recently delivered over 135,000 petition signatures collected nationally to Walgreens stores in Hartford and Boston. I feel really fortunate to live in the kind of community where your neighbors are a cornerstone of your life — we get together for coffee on Saturday mornings in our pj’s, we take care of each others’ pets when someone goes away to travel, and we share our family life. In the past 5 years, my two closest neighbors and I have all lost our moms to cancer. Our 3 moms grew up in different areas, had very different lives, struggled in different ways with 3 different kinds of cancer. But the bottom line is that as neighbors, we tried to help hold the pieces together as we each struggled with first taking care of our moms and then learning how to live without our moms after they passed away. There wasn’t a specific chemical spill that had exposed our moms to cancer-causing chemicals, they didn’t work together in a potentially sick building, and none of them had a family history of cancer. So how did this happen? How is it that all of us lost our moms too early in our lives? Why are cancer rates, and rates of other chronic disorders linked to toxic chemicals like learning disabilities so elevated population-wide?